An aerial view shows the aftermath of a retention pond wall collapse at the Tennessee Valley Authorities Kingston Fossil Plant, Monday, Dec. 22, 2008 in Harriman, Tenn. 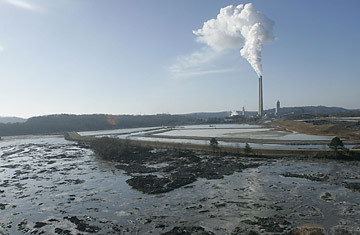 The Tennessee Valley Authority says the 40-acre pond held a slurry of ash generated by the coal-burning Kingston Steam Plant. If you paid any attention to last year's Presidential campaign, you'll remember ads touting the benefits of "clean coal" power, sponsored by the industry group American Coalition for Clean Coal Electricity. (The ads featured lumps of coal plugged into an electrical cord.) Designed in part to respond to the growing green campaign against coal power  which accounts for about 30% of U.S. carbon emissions  the ads promised high-tech and eventually carbon-free power, emphasizing coal's low cost compared to alternatives, its abundance in America and its cleanliness. More than two weeks after the spill, workers and machines are still trying to clear the estimated 5.4 million cubic yards of coal ash from around the plant. The breach "is an environmental catastrophe that reveals not only the dangers of burning coal and mismanaging coal combustion waste, but also the need for federal regulation," said Steven Smith, executive director of the Southern Alliance for Clean Energy, at a Senate hearing on the spill on Jan. 8. After Kingston, coal may be considered many things  but it's hard to see how "clean" could be one of them. That's because, even putting aside climate changeaccelerating carbon dioxide, coal remains a highly polluting source of electricity that has serious impacts on human health, especially among those who live near major plants. Take coal ash, a solid byproduct of burned coal. A draft report last year by the Environmental Protection Agency (EPA) found that the ash contains significant levels of carcinogens, and that the concentration of arsenic in ash, should it contaminate drinking water, could increase cancer risks by several hundred times. A 2006 report by the National Research Council had similar findings. "This is hazardous waste, and it should be classified as such," says Thomas Burke, an environmental risk expert at Johns Hopkins University who has studied the health effects of coal ash. But the ash isn't currently classified as hazardous waste. Though the EPA in the past has come close to imposing stricter rules on the treatment of coal ash, the agency has repeatedly backed down in the face of opposition from utilities and the coal industry. As a result, hundreds of coal plants around the U.S. are allowed to dump their leftover sludge in unlined wet ponds like the one used by the Kingston facility. Not only does that raise the risk of accidents like the Kingston spill, but the toxins in the ash could seep into the soil or groundwater, contaminating drinking water supplies. Environmentalists would prefer federal regulations that require ash to be buried in lined landfills that would prevent leakage. "You can't talk about clean coal without dealing with this problem," says Eric Schaeffer, the director of the Environmental Integrity Project, which just came out with a new report finding that there are nearly 100 other largely unregulated wet dumps like the Kingston facility across the U.S. In reality, we can't really talk about clean coal  it doesn't exist. Though the coal industry is right to point out that it has improved filters on coal plants, sending less traditional pollutants like sulfur dioxide and mercury into the air, the toxic waste that remains behind is only growing. The biggest advantage of coal power has been cost  in most cases, it remains much cheaper than cleaner alternatives like wind, solar or natural gas. But the cheapness of coal depends on the fact that external costs  climate change, or the health impacts of air and water pollution from coal  remain external, paid for not by utilities or coal companies but society as a whole. The coal industry itself estimates that taking better care of fly ash could cost as much as $5 billion a year  and if the government imposed a tax or cap on carbon dioxide, the price of coal would certainly rise. "For all the money the industry has spent to mislead the public, [Kingston] shows that there really is no such thing as clean and cheap coal in the U.S," says Bruce Nilles, the director of the Sierra Club's National Coal Campaign. That's not entirely true. As we grapple with global warming, coal can be cheap or it can be (somewhat) clean. But the sea of ash in Tennessee shows it can't both, and that's a reality we need to face as we plot America's energy future. See the world's most polluted places.